[This blog post first appeared on LearnHowToWriteANovel.com in January 2019]. There was one vaudeville act that always fascinated me. It wasn’t the clowns, the guy juggling the swords or the lion tamer who managed to stick his head somewhere near his pet. The act that always fascinated me was the plate spinner. This was the performer who kept thirteen plates spinning on the end of thirteen poles … and none of them fell. He ran back-and-forth from pole to pole, giving the plate the slightest wobble, steadying it and giving it enough momentum to keep spinning. It was more than skill. It was more than hand-eye coordination. It was a commitment to the plates, and never letting them fall. It was knowing that each plate needed to be watched and needed to have attention paid to it. It was knowing that the whole act depended on everything being kept moving. You know that vaudeville act is so much like writing. I’ve found myself a plate-spinner with three projects on the go at once – a debut novel coming out in March which requires marketing, a follow-up novel which requires editing, and the third book for early next year which requires creating. So how do you keep everything moving? I’ve found three things that work for me. I was talking to my mentor – James L Rubart, but you can call him Jim – about how to balance everything. After all, he’s a guy with 10 books on the go in various guises. Jim had one piece of advice for me that not just stuck, it described my situation and helped me to move on with them. Not all energy is created to be equal. You require emotional energy for creation, so it makes sense to use the time at which you’re at your emotional energetic best to create. For me, that’s the morning. So before I was trying to do all things at all hours and wondering why it wasn’t working. It’s because I was investing my energy at the wrong times. So now I write in the mornings and leave the marketing tasks (which are more process-driven until later in the day). The plate-spinner doesn’t spin thirteen poles AT ONCE. The plate-spinner gives is a little attention to keep things spinning before moving on. That’s not to say he spends hours on that one pole, but when he’s focussing on it, his entire attention in on it. I have found some value in focussing on one pole at a time and then spending the right amount of time on it. You need to prioritise your deadlines to ensure your work is being focussed in the right direction, and so that’s what I’ve done. After submitting book two to the publisher, I now turn my attention back to marketing The Baggage Handler, because that is what’s next. You can schedule posts for your platform for a week, and not feel like you have to do the full month. Write one newsletter article, but not the whole thing. Focus on one part of your platform, but not all of them. If you’re the type of detailed person who likes a job done “properly”, then this may not work for you, but if you aren’t, you might find it frees you up. It did with me. If I was to learn the art of plate-spinning, I wouldn’t go for thirteen up first. I would start with one, then add a second, then a third. I’ve actually pared back my social media because I was trying to be all things to all people. I looked at everything I COULD do. One thing I’ve discovered when you try to be all things to all people is you end up being not much to everyone. So I now focus on what I SHOULD do. And here’s the thing: once I get a better handle on what I’m currently doing, I can always add those platforms back in. 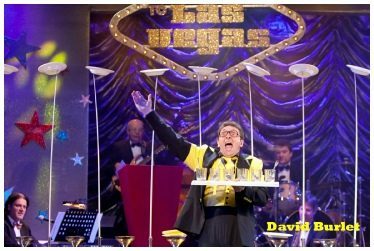 So, in 2019, as you look at the range of things you COULD do, remember the plate-spinner whose success is based on the things he SHOULD do. So are you a plate-spinner? If you are, leave a comment below on how you manage all the things in front of you.